The first few years that I home schooled, I would try to schedule out each week ahead of time. Even so, sometimes I would wake up in the morning and wonder,“What were we supposed to do today?” It’s amazing how brain dead you can get with mountains of laundry, dishes and papers to be corrected staring you in the face. Several years later (Don’t wait that long!) 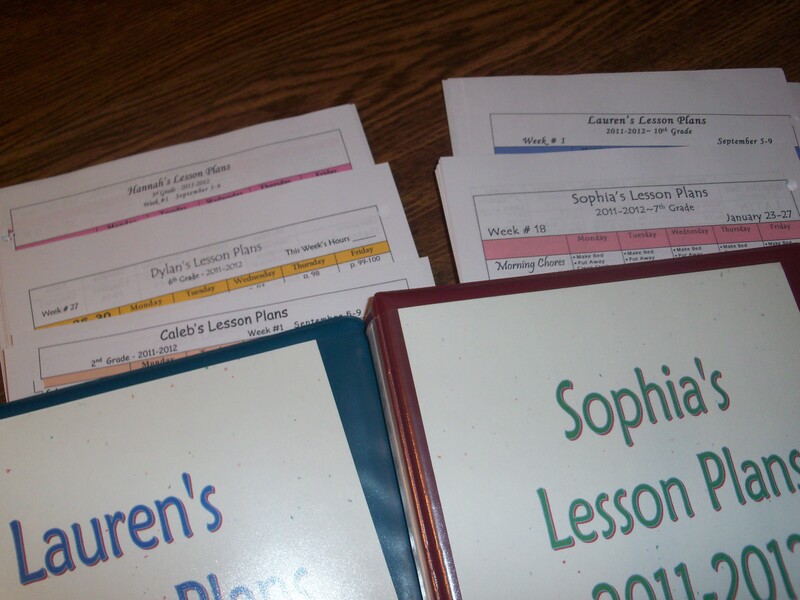 I finally learned how to lay out a lesson plan that was easy to use and very effective. I have used that same basic format for nearly 20 years now and we couldn’t function without it. This has made a world of difference in our home schooling day and in what we accomplish in a year. My method is not by any means the only method out there, and it may not be right for you, but for those of you struggling with how to plan your day this is well worth the effort. If you are doing this on computer, enter as much of the unchanging information into your table as you can, then highlight it, hit copy, and paste it 30-40 times (depending on how long your school year is). You can then type in (or cut and paste) the various assignments for each week. You may skip this part if you don’t want to have a record on the computer of the whole year. If you are doing it by hand, make a master chart for each child, then run 40 copies of each one. I buy different colors of paper to print out our lists, and assign a color to each child. It makes it easier to identify who’s list is laying under the coffee table and it gives the task list a cheery look. Use bright colors! Here are some blank forms you can copy if you prefer to write them out by hand. Make a stack of all the books you plan to use for each child. If you will be using more than one book for a subject — for instance, reading a book about electricity, one having electricity experiments and one about Thomas Edison — make note of what order you wish to read the books. If you are doing unit studies, determine how long you will spend on each unit and what books and activities you intend to use. Now you need to decide how to break each book down into daily assignments. Some books are easy. With many text books it is obvious to do one lesson a day and reserve some days for tests. Other books are not so clear cut. They may only be used for a few weeks, or may not be broken down into easy-to-divide lessons. I’ll page through these books, determine how much I think my child can handle in one day and break it down that way. I might otherwise decide how many weeks it should take to complete this book. I will look at the number of pages /chapters/lessons and determine how many need to be done each day or week in order to meet my goal. For instance if my child is to read a 23 chapter book and I think he can handle 2 chapters a day, I know it will take 12 days to complete the book. I’ll then decide if we can afford to spread it out over 3 weeks or if we’ll have to fit it into 2 weeks. If I’m breaking it down by pages rather than lessons or chapters, I will actually page through the entire book to figure out where a logical place to break would be. You don’t want to end the week two pages form the end of a section. In this case, I figure out how many pages we should average a day and try to break it close to that amount. In addition, you’ll want to note any special activities of field trips you want to do when studying a book. You don’t have to do every subject 5 days a week. As much as I am able, I try to keep each subject down to 4 days a week, and each day I alternate which subject gets skipped. This way if we have a field trip or day off, say on Friday, I can schedule every subject’s “off day” for Friday that week, and not have to catch up. You should type out or write down your breakdown of daily assignments for each book. Here’s a six week segment for a science book we used. Once you’ve broken down all the books you can transfer the daily assignments to your weekly lesson plans. Here is where individual preference really steps in. Because I store all this in my computer (where it’s really easy to cut and paste changes as we go along) I try to lay out the daily lesson plans for the entire year. I usually spend my summer months doing this. I know from experience that I don’t have much time or brain power to do this once the school year starts, and if it’s not written out it doesn’t happen. This can be an overwhelming task and you may prefer to fill out your forms week by week. If you have a list of daily assignments for each book this is not difficult. Just check off the assignments you’ve completed and you’ll know exactly where you’re at. Here is what a weekly lesson plan incorporating all the subjects will look like. There are some incredible benefits to having a plan such as this. that you’d really like to fit in some time actually get assigned and completed. You hand your child the assignment sheet each week (or tape it on the wall) and both you and your child know exactly what needs to be accomplished. If you file the paper at the end of the week you have a nice record of what you’ve done. It’s a great lesson and satisfying experience in setting and completing goals. It places both the freedom and the responsibility of effective time management in your child’s hands. My boys cross off each box as they complete it. If your child is feeling particularly motivated he may whip through the tasks in a few hours. If he is dragging his feet, you simply don’t allow school to be done (no TV, no play, no dinner if need be) until all the day’s assignments have been checked off. My boys will occasionally decide they want a day off and work diligently for a day or two to get an entire day ahead. I don’t specify any order as to how they have to work through their day – as long as they get through the whole list. School is no longer done or not done according to how frazzled Mom feels today. It also makes my boys happy to know Mom is not going to just keep adding assignments to their day until they faint with fatigue! 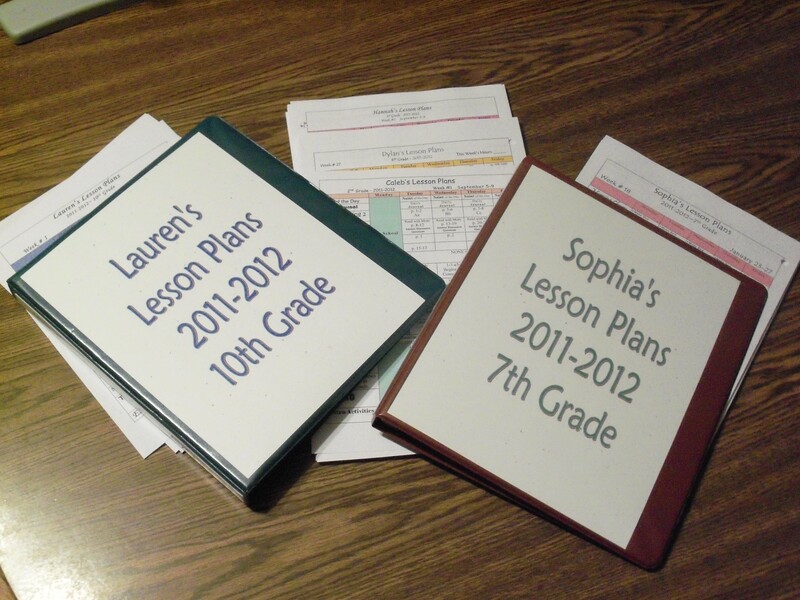 I hope this helps give you an idea on how you can organize your lesson plans. For me, the important thing is that each child has their own sheet. The teacher planning books are good for one or two children, but there’s just not enough room for larger families. If this whole thing is too overwhelming for you, keep asking others how they do it until you find a system that works for you. I’ve known people that just write out at the end of the day what they’ve done that day. I personally am too tired at the end of the day (and lacking in the discipline) to take the time to do that. Others will write a date in the corner of the workbook pages which shows when that page is to be completed. Still others will just fill out lesson plans each weekend for the upcoming week. If your system is not working, find a solution. If it’s working well, stick with it.